After 50 hours of work, more than 5000 line added and 10000 deleted, and 250 files changed it's finally done. This is the biggest refactoring done in the history of the project. 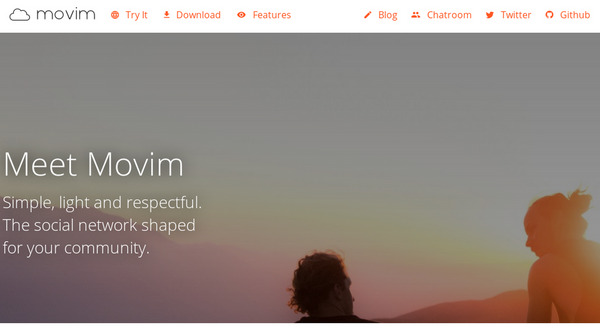 Movim is a social network and instant messaging web client for the XMPP network. It grab data from XMPP and store them temporary in a SQL database to present it in a light and simple UI to the users. The database library is therefore a really important piece of the architecture. Most of the existing features were ported to the Eloquent, some others are temporary disabled or simplified. Those, like the suggestions of Posts and Contacts, will be improved in the upcoming months. You can also expect many small bugs here and there. The plan is to take a couple of weeks (months?) more to stabilize the code and do a proper 0.14 release. For those that want to try out the current release, the Installation Tutorial on our wiki has been updated to reflect the changes introduced in this release. Here is a small sum-up. Be sure to do a backup of your database before. It only takes a few seconds and it will allow you to do it again if you have any trouble during the migration. For PostgreSQL you can do. Then you can turn off the Movim service, if you are using systemd you can do. Go to the Movim path and pull the new code, then update the Composer dependencies. You don't have to change anything in the configuration, the daemon will also refuse to start if some of the following steps are not finished properly. You can then migrate the database to create the new structure. Like always you can help us by covering our monthly costs on the Patreon page or by doing a one time donation on Paypal. You can also help us by writing blog posts, tutorials or talk about the project on the other platforms (Reddit, Twitter, HackerNews…) :) If you have remarks or questions, do not hesitate to join us on the official chatroom, movim@conference.movim.eu. Two months after Movim 0.12 – Lovejoy here comes the new release of #Movim for #Christmas. This is maybe one of the biggest changes that is brought to our users for this version. Since 2014 Movim is using a full real-time architecture which was slightly improved and optimized through the years. Movim Coggia comes with a totally new way of handling and distributing the events and messages in the core of the project. The daemon is now using ZeroMQ (and the related PHP library php-zmq) to take care of all those internal communications. This allows Movim to be fully multi-threaded and to properly prevent some user sessions to slowdown others if they are using the backend intensively. Following those changes, many buffers were removed to unlock the full potential of #ZeroMQ. This means that the messages and events are now directly pushed to you (or to your server) without waiting lanes. Movim now feels way more snappier on all devices (especially mobiles). This version also brings back HTTP #Ajax requests in the project. Those will only be used in specific cases, mainly to ensure the good delivery of some requests to the backend. The first place where this is now used is for the chat messages delivery, they were previously sent using Websockets. This previous method didn't guaranty the message was successfully handled by the backend. By sending those messages using Ajax requests we can now know if we had a network failure or some troubles on the line and then display a proper message to the user. Nigthmode, your eyes will love it! This version is not only coming with changes in the project's pipes but also brings some nice improvements and features to our ever-growing user base. And because the configuration is shared between all the Movim instances you'll be able to have it everywhere you log-in. Several bugs were fixed in the chatroom session handling to take care of the different behaviors between the existing XMPP servers. A loading state was also added to notify the user to wait for the full connection of his account with the chatroom before doing anything with it (posting messages, inviting users…). The connected users list is also now sorted by name and Movim gives you some proposal to autocomplete your chatroom address when you are typing it. The login form has been slightly redesigned and simplified as well as the form to configure your Community (the advanced form is still available by pressing the menu button). The Miho stickers pack has been fully completed and now includes 16 unique stickers for all our users :). The full pack has also been published on the LINE Creator Market, if you are also using LINE you can now support the project by buying (or offering) this pack of stickers. The Likes are now collapsed in one little block below the articles to give space to the comments. With the help and feedback of the users, many small bugs related to the articles publication were fixed. ReactPHP, the library that Movim is using to handle the real-time part of the project has been updated to its latest version. Help us to push Movim further in 2018! In 2018 we would like to do everything to bring Movim to the maximum of users and show them all the possibilities offered by the platform. For that we will need your help. You can naturally help us by directly contributing to the project by discussing new features and improvements on our official chatroom, fixing bugs or helping with the translations. But we are especially looking for people that would like to talk about Movim online by writing articles telling how they are using the project, giving nice examples and tutorials on how to play with Movim and the XMPP environment and more generally spread the word about project. Finally you can help us by giving a bit of money to cover our monthly costs for the servers, domains and other expenses. We hope that 2018 will see Movim and the Movim services to be fully funded by the community. To help us with that you can become a Movim Patreon or donate some money using Paypal. We wish a Merry Christmas and a Happy New Year to all of you. See you in 2018 for more exciting features and surprises!